Paddle easy handling sit on top, inflatable kayaks down the Chilliwack River under the direction of your expert river guides. 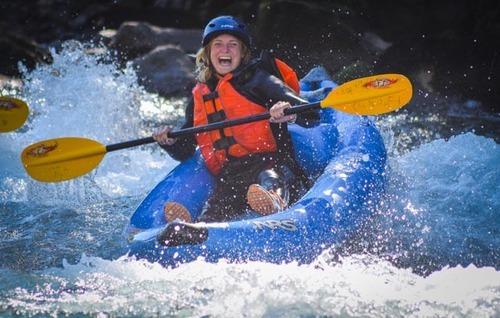 Your guide will coach your technique and lead you on the safest or more challenging routes through the rapids based on your desired level of adventure. No prior kayaking experience is necessary for these gentle, forgiving boats. All kayakers must be able to swim. Our kayak tours are non-stop action, and begin with easy class 2 rapids progressing up to class 3+ rapids which can be walked around if desired. In the event the water level rises too high, or you have less adventurous group members, a rafting trip can be offered as a substitute. In the event the water level is too high, a rafting trip can be offered as a substitute.